Former Olympian Jonny Bellis has been suspended as sporting director of Drops Cycling Team after being convicted of assaulting his girlfriend. 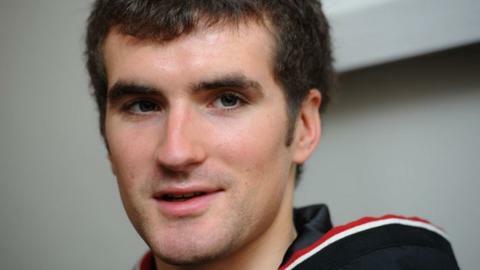 Bellis, 30, represented Great Britain in the road race at the 2008 Olympics before racing for professional teams. On Tuesday, he told Cheltenham Magistrates Court he hit his partner at their home this month after the couple had been out drinking. UK-based women's team Drops said he was suspended "pending an investigation". In court he was fined £635 and ordered to pay the victim £100 in compensation. He was also given a five-year restraining order and told he must make no contact with the victim. Bellis rebuilt his career on the bike after suffering serious head injuries in a life-threatening scooter crash in 2009. After spells with teams including Saxo Bank, An Post-Sean Kelly, Christina Watches-Dana and ONE Pro Cycling, he retired in 2015.